Here's a simple one-pager (front/back) full of publicity tips. It's a lite or sound-bite version of the following Publicity Manual. This manual lightly touches on many aspects of publicity or public relations from a FIRST team perspective. It goes into somewhat more detail on writing press releases and getting them published. This manual began as a simple idea to introduce teams to how public relations and publicity work and to encourage them to get started. Publicity is how your team gets funding, members, advisors, mentors, resources. Students cannot join FIRST if they don�t know about it, fundraisers and events must be advertised to attract audiences and sponsors are more likely to contribute if they�ve already heard about you. You should give your sponsor and school good press coverage because they deserve it! Toot your own horn. People will never know what great things your team accomplishes unless you tell them, and that includes using newspaper and magazine articles as well as broadcast media to promote the team and FIRST (For Inspiration and Recognition of Science and Technology), recruit new students, advertise for events, appeal for engineers, appeal for resources. You�re showcasing and promoting both the best features of your team and FIRST objectives and goals. But I'm not selling anything am I? FIRST is all about selling the Science & Engineering professions to students to convince them to pursue these careers. You also promote your team to potential student members, to judges, to potential alliance partners. You are selling FIRST to your sponsors in convincing them to invest in you and your future. You are selling both FIRST and your team everyday. Many students don�t enjoy math and science enough to become engineers for those reasons, so stressing that engineers get to do a lot of science & math attracts a very small percentage of students to the field. Develop a marketing plan to give your team definition, planning, organization, message clarity, content, service, administration, personality, usefulness. Relationships -- Marketing is developing and maintaining relationships with your customers. Let them know you are there. Let them know what you are accomplishing. Let them know of your successes and also where you need help. Don�t change your team name, look, identity every year. Design and settle on a look that works for you, then stick to it. Socialize at competitions as well as in the grocery store, on the soccer field, everywhere! What do sponsors and school administrators see? Your presence at local events, such as, fairs, trade shows, parades, company picnics, sponsor appreciation demos. What do other teams see? Give-aways/product placement -- Give teams something that they�ll remember you by. Something useful that they�ll reach for and use for year�s to come. Something unique that gets associated with you alone. Robot Pit sheet -- If you have the resources make two versions of this for the pit scouters that come around from other teams on Thursday and Friday, then an updated version that you distribute on Saturday morning to the teams in the top of the standings. 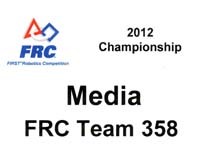 Actual Competition record �- hard numbers from your own or other scouters emphasizing your robot/drive team strengths.